"7 Summits Club" is the International Alpine Club for those wishing to climb all Seven Summits. Volcanoes of Ecuador (Cotopaxi - the highest active volcano of the world, the highest volcano of Ecuador; Iliniza Norte) - 9 members successfully climbed the volcanoes. during the year 2003-2007: 16 times within the last 3 years “7 Summits Club” organized Elbrus 5642m expeditions 4 out of them in winter. 135 members successfully reached the Top of Elbrus. 14 times within the last 3 years “7 Summits Club” organized Kilimanjaro 5895m expeditions. All in all over 500 people took part in our expeditions within the last 3 year. Leader of the"7 Summits Club"
Master of Sports of the USSR in Mountaineering, Climbing instructor and mountain guide, mountain cameraman. Chairman of Trainers’ Council of Moscow Climbing Federation. Chairman of Moscow Ice-Climbing Committee. Chairman deputy of Russia Ice-Climbing Committee. Member of the Russian Geographic Society. Organizer and leader of several famous projects, such as:“7 Summits”, “Land-Rover on Elbrus summit”. 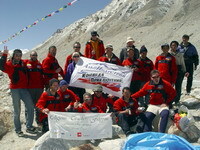 Has been involved in climbing and organization of expeditions and competitions for over 20 years. For the last 13 years – on professional level. Up to 1990 had made over 100 ascents of different categories of difficulty. Has many ascents in the mountains of Check Republic, Slovenia, Bulgaria, France, Switzerland, Uzbekistan, Tajikistan, Kyrgyzstan, USA, Alaska, Argentina, Indonesia, Tanzania, Nepal , Tibet, Australia, New Zealand, Crimea (Ukraine); over 40 winter and summer ascents on Elbrus. Most Prominent Achievements of the last 13 years. 2005/2006 Leader of the 3 successful ascents to Vinson Massif (4897m), Antarctica. 2005 Leader of the new one successful expedition to Everest (8848m), Tibet. 2004 Leader of the new one successful expedition to Everest (8848m), Tibet. Leader of the expedition on Aconcagua(6967m), Argentina. Leader of the Kosciuszko (2228m) and peak Cook (3800m) expedition Australia,New Zealand. 2003 Leader of the new one successful expedition to Everest (8848m), Tibet. Leader of the first Russian expedition on Ararat (5137m), Turkey. 2001-2002 Created “7 Summits Club”. Rock&ice climbing in Europe and Africa. 2000 Leader of the successful expedition to Everest (8848m), Tibet. 1999 Leader of the Cho-Oyu ascent (8201m). China, Tibet. Leader of the expedition on Kukurtlu (4600m), 6B. The 3rd place in Russia Championship. The first winter ascent of Aksu (5400m), 6A. Silver medals in Russian Championship in winter ascents. 1997 Leader of the winter ascent on Ushba (4700m), 6A. Member of the expedition on Lhotse Middle (8411m). 1995 Leader of the expedition on Kilimanjaro (5900m). The expedition made a new route on Breach Wall. Leader of the winter expedition on MontBlanc (4810m), France. 1994 Beginning of “7 Summits” project. The leader of the successful expedition on McKinley (6100m), USA, Alaska. 1993 Member of the expedition on Everest (8848m), Nepal, up to 8000m. 1992 Professional mountain guide in “Pilgrim Tours” tourist company. Led more then 10 groups of “REI” company (USA) on Elbrus(5642m). 1991 Champion of the USSR in winter class – Svobodnaya Koreya Peak (6A).